Bronze medal and club record for Emma! 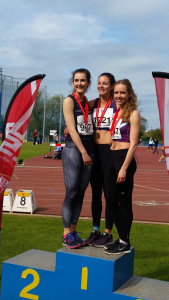 Emma was joined in making the finals on day two of competition by Emily Maltby competing for Bedfordshire University in the triple jump. Her qualifying jump of 11.05m was a seasons best again in the rough weather on Saturday. Emily then repeated the distance recording 11.06m in the final despite a slight head wind and finished a creditable tenth place.